Evidence of cheese production is found as early as the Egyptians, however it is thought that humans were producing it long before then. One legend has it that a merchant crossing the Arabian desert poured milk into a pouch made from a sheep’s stomach. The combination of the strong sun and the rennin from the stomach lining caused the milk to congeal, and as the merchant journeyed the milk separated into curds and whey. That evening, or so the story goes, the hungry merchant was the first human to eat cheese (i.e. the curd). Following the cue of the Swiss, 19th and 20th century America went gangbusters over industrial cheese production. To keep pace with demand, milk was sourced from numerous ever-growing dairy farms, rennet was mass produced, and scientists were employed to help standardise the taste. By World War II, consumption of traditionally produced cheeses was overtaken by factory-produced cheese. For years, disdainful Brits had referred to American cheese as “factory cheese,” but this was only the beginning. 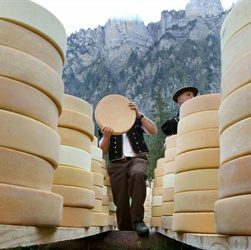 Photo Caption: Farmers and cheesemakers handle loafs of cheese during a traditional cheese festival in Switzerland.